Without that plaque, no one would have guessed that the tree, known only to a few as the Lenin Oak, was a communist tree. marker was still there. His questions, in particular, why a monument to a communist leader was allowed on U.S. Government property, drew the attention of the Tampa Tribune. The resulting publicity ralled the local citizens and sent officials scrambling, from Brooksville all the way to Washington. The events leading up to the controversy began in the late 1800s when young Raymond Robins, a resident of Hernando County, Florida, by way of New York, began to acquire an interest in labor relations and social reforms. He held several jobs, including commissary clerk at a local phosphate mine and a field hand for Dr. J.R. Snow. 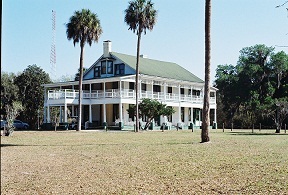 Raymond developed an affection for the mansion on “Snow Hill,” which at 367 feet above sea level, was considered the second highest point in the state of Florida. Margaret Dreier, whose green thumb made the tribute to Lenin a reality, met Raymond Robins in 1907 after listening to him give a sermon in New York on the social gospel and “the plight of exploited workers in America.” Discovering how much they had in common, the two social activists married soon after and spent their honeymoon in Brooksville. Margaret was an ardent participant in the women’s suffrage movement and also advocated the enactment of child labor laws. She served as president of the Chicago Women’s Trade Union League and later president of the National Women’s Trade Union League. Both Raymond and Margaret found that Chinsegut, with its peaceful nature, was the ideal place to revitalize their spirits. Chinsegut also served as a retreat for Americans who shared their political philosophy. They included social reformer Jane Adams, William Jennings Bryan, Thomas Edison, James Cash (J.C.) Penney, and Harold Ickes, Secretary of the Interior of the United States (1933-45). It was during World War I and the Russian Revolution that the Robins became enamored with communists and communism. Given the title of colonel, Raymond went to Russia as the head of the U.S. Red Cross mission from 1917-18. In addition, he served as an operative for U.S. Army Intelligence. He traveled throughout Russia on a fact-finding mission but with a personal goal of gaining American recognition of the new nation and establishing economic relations with a country he thought would be a valuable market for American products. Toward this end he had a number of talks with the leader of the Bolsheviks, Nikolai Lenin. Margaret Robins wrote to her husband in the spring of 1918 to tell him she would plant an acorn on Chinsegut Hill in order to commemorate his visits with the Russian leader. The colonel wrote back, declaring that if the tree grows, they would call it the Lenin Oak. The tree did grow and years later, whenever the Russian ambassador visited Chinsegut, Americans and Russians would gather by the tree for photographs. Back in the United States the Robins decided to transfer their property to the federal government in 1932 with the proviso that they could live at Chinsegut until their deaths. The land was then utilized by the USDA as an agricultural experiment station. Margaret died in 1945 and Raymond joined her in death beneath the Altar Oak, just east of the mansion, in 1954. But it was the Lenin Oak that gave Chinsegut its moment in the spotlight. After the April 6, 1961 issue of the Tampa Tribune was circulated, the uproar began. According to the Tribune, John Tracy, commander of the Brooksville American Legion Post 99, contacted the United States Department of Agriculture in Washington and was assured that the USDA would investigate the report fully. State Senator Nick Conner and Representative John Ayers of Brooksville called U.S. Senator Spessard Holland to let him know how angry their constituents in Hernando County were concerning the plaque. And a radio station in Brooksville reported that “…feelings were even stronger in Masaryktown, home of many refugees from Russian communism. Dr. John S. Allen, president of the University of Florida, joined in on behalf of his university and the University of South Florida Foundation. He denied any involvement by either organization with the monument to Lenin. 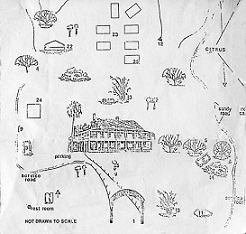 At the time, the South Florida Foundation had a use agreement with the USDA for the mansion and surrounding 14 acres, which was previously held by the University of Florida. Lisa Von Borowsky, employed by the Robins and a resident of Chinsegut from 1924 to 1954, told me it was she who had ordered and paid for the plaque. Ray Hatfield, a Brooksville contractor, installed it. Borowsky, who was 94 at the time of my interview, still resided in Hernando County. She told me that it was the superintendent who took the plaque to the dairy barn, melted it down, and threw it in nearby Lake Lindsey. I visited the site in 2001 and still found Chinsegut to be the the quiet, peaceful place the Robins said it was. I tried to find the Lenin Oak using an old map from the local library. I drove up the hill and near the top made a left that took me to the USDA offices. I followed the access road past the building and made a right. If I’m correct, the oak is on the right, just a few feet off of the road. But it didn’t have the thick spreading limbs that are typical of older oaks. Several of the oaks are named and former residents of Chinsegut are buried near them. For example, Margaret and Raymond are buried near the Altar Oak. No one has been able to to tell me where the tree is but you can give it a try. Chinsegut is not a tourist attraction but I’ve had no problem walking around and even visited the mansion with guidance from the caretaker in the past. But today Chinsegut Hill, including the mansion, is the site of the Chinsegut Hill Conference and Retreat Center. It accommodates business, retreats, weddings and other functions. Reservations are required. For info, the onsite number is (352) 796-6254. Directions to Chinsegut Hill.